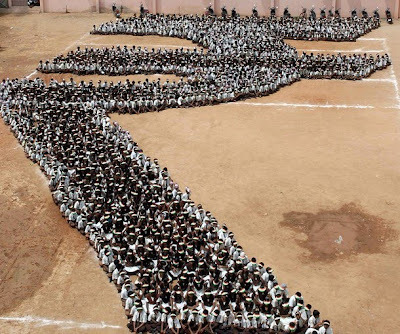 Indian schoolchildren form a shape corresponding to the new symbol for The Indian Rupee as they sit on the ground at a school in Chennai on July 16, 2010. India unveiled July 15, a symbol for its rupee currency that it hopes will become as globally recognised as signs for the dollar, the yen, the pound and the euro. Ministers made their final decision at a cabinet meeting after examining a shortlist of five designs inspired by the letter 'R' in the Roman alphabet and 'Ra' from the ancient Devanagari script used in Hindi.